Vegetarian | The Eat Team Vegetarian | Eat. Art. Travel. Live your best life. Yui got in touch with us about her new project, The Raw Sisters, after our friends at the Hungry Workshop letterpress told her about The Eat Team. We sat down to chat with her at Nothern Soul cafe in Thornbury, Melbourne. Yui and her partner in crime Missy started the Raw Sisters vegan and vegetarian pop-up and catering duo with a bang–they served over 100 folks at their first gig which only whet their appetite to serve the Melbourne community. They’re brand new and the future looks bright ahead. Check out their beautiful video (see below) from the event at St. Kilda Organic Food Co-op and read on for Yui’s insights on the Raw Sisters project, eating raw, and life as an occupational therapist. Raw SistersC from Yui Yamashita on Vimeo. How did the Raw Sisters start? We did a raw food demo at a vegan festival that my friend and her partner organised. We did raw sushi and raw avocado juice. Some guy came up to us and asked if we wanted to do a catering event. We had no idea that we wanted to do catering but thought it would be fun, so we said yes. He didn’t get back to us for ages and then a few weeks ago he said that the event is happening soon and asked if we were still interested. We quickly made up a business card and menu for our meeting with him. We bought everything and cooked for a whole day. We’d love to do more catering, or even cooking classes. We love food and want to share our passion. What was the event that you did the catering for? St Kilda Organic Food Co-op. Unfortunately they were closing and wanted to have a big ‘Thank you’ event for all of the people who had been involved. Everyone was invited so we had to cater for kids and adults. We did raw salads, hummus and beetroot dip, garlic bread, ‘mac and cheese’, home made wedges, roast veg, sweet potato soup, Moroccan stew, carrot pilaf, and for dessert we did chocolate brownie and caramel apple cake with banana ice cream. Do you, and your business partner Missy, both lead a raw lifestyle? Missy is maybe 80% raw. In winter I’m 50% raw. We’re both vegan and we try to eat organic. Have you ever eaten meat? I used to when I was in High School. I stopped after I turned 17 or so. I went on this school trip for a month and every meal was meat! After that I said to my parents that I didn’t want any more. These days my reasons have changed to environmental issues and how eating meat consumes a lot of energy and uses water. Are there any meals that you used to eat that you now miss? No. There’s a lot of fake meat products on the market now. I went to Gasometer at the weekend and had a chicken parma. Some of the products you can buy are really processed though, so I would rather eat beans, quinoa or grains. Is Missy your actual Sister? No. I met her through a mutual friend. She went to New Zealand for High School and then came over here for Uni. She’s a photographer. We got really close and started talking about food. As you know, food connects people. How did you think of the name ‘Raw Sisters’? At work we call all the girls ‘Sisters’ and thought that ‘Raw Sisters’ would be fitting. I work as a Community Mental Health Worker, I’m an Occupational Therapist. It’s a totally separate thing. It’s not just about chopping and eating a salad, it’s about dehydrating it or making it a smoothie or thinking up new combinations. How did you get in to raw foods? I’ve always been into health and healthy foods. I found out about raw food through blogs and I’ve been eating raw since spring of last year. This will be my first winter. Have you noticed a difference in your health? Definitely! I’ve got so much more energy and feel really good inside. The general idea of raw food is that because you don’t cook it, the enzymes aren’t broken down so it’s in it’s most natural form. You get the most benefits from all of the vitamins that way. There’s different views on it, some people find it easier to digest, and some harder because it’s so raw. It depends on how you prepare it. It’s not just about chopping and eating a salad, it’s about dehydrating it or making it a smoothie or thinking up new combinations. Personally I get a lot out of eating raw food. I find it works best for me if I eat a portion of raw food and then cooked food as well. What would you eat on an average day? This might sound weird but I don’t have breakfast. For lunch I’ll make a green smoothie to start my digestive system going. If I’m working I’ll have a sandwich of sourdough bread with lots of raw food on top, maybe sliced pumpkin, beetroot, kale, avocado, with a bit of hemp seed butter. For dinner would be a salad, lentil or bean soup, or quinoa patties or something. Is it hard to find restaurants that cater for your diet? Whenever I go out I do my research. I think Melbourne is quite good with vegan food and places seem happy to take the cheese out, or whatever you ask. What’s your favourite food to prepare or eat raw? I really like my kale salad with a nutty dressing and for dessert I love raw cheesecake. Are you hoping one day to have a cafe or a shop? Yeah, a cafe would be amazing. Missy and her partner are going to move house soon and hopefully open a cafe. Will this become a full-time thing then? I’m passionate about my work so this is good as a side project for now. Would you like to continue to do events? Yeah! They’re really fun. The event that we did last time, we got to meet a lot of people and they had so many compliments. To see them making that connection with food, and talking to them about it, was great. Have you converted anyone to the raw lifestyle? I have a massive influence at work. I’m really passionate about organic eating as well so I tell all of the girls. Organic farming is so much better for the environment too. Through the events we have a little blurb about how it’s so much better for us. I get a box delivered from Ceres. They do a fair food co-op. It’s not that they grow everything there but get it from local farmers. Also, Naturally on High on High Street . We got most of our catering ingredients from there, they’re really good. Did you have a foodie upbringing? Not really. My Mum is such a ordinary cook. That’s maybe why I’m about experimenting and making new things. I don’t like to cook two of the same things twice. I love baking as well. If someone was wanting to get involved in the raw food diet, what’s an easy recipe to start them off? I think the juices and smoothies are a really good place to start. You just throw everything in; vegetables and green leaves. Just give it a try! What’s the one thing you want to do before you die? Travel. Build my own house. I watch a lot of Grand Designs and England and France seem open to the ‘eco’ style of living. Somewhere in Europe would be nice. On a bright and sunny Byron Bay day we sat down with Tusta, head chef of Heart & Halo, a hare-krishna inspired restaurant. His tangy home brewed chai awakened our senses (and tastebuds) and the beautiful curry really did remind us of family cookin’. It was hearty, wholesome, and downright delicious. We’ll let the photos, his description, and the interview speak for themselves. It’s basic human nature to look after each other. “Heart & Halo offers a wide variety of global vegetarian dishes with distinct Indian Ayurvedic influences. Tusta, the head chef brings over 20 years of experience and adds his own flavour and style to all meals he prepares. Tusta has travelled to many places of the world but it is his love of India that has influenced his cooking the most. All meals are vegetarian and will tempt even the most fussiest of eaters. Heart & Halo sources only the freshest spices, beans and grains to ensure the fullest of flavour. Only healthy oils are used for cooking and Himalayan salt is used to help improve your wellbeing. 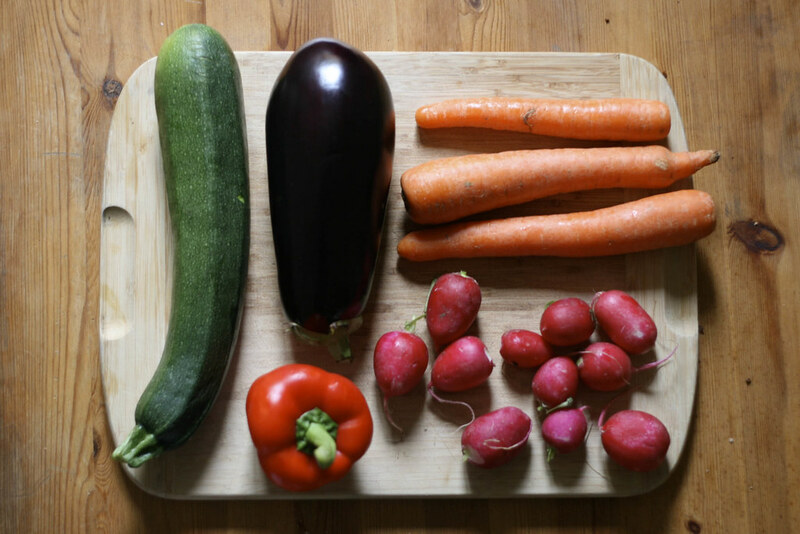 The best local & organic produce is used when and where ever possible to make our fabulous vegetarian meals. Heart & Halo offers an amazing range of great value Curries, Vegetable Baked Dishes, Hearty Lentil and Vegie Soups, Rice, Bean and Grain Dishes, the freshest salads and a selection of mouth watering drinks, sweets and snacks. All that we prepare and offer contains only the best ingredients including Himalayan Salt. With 84 trace minerals, your body will benefit even long after your meal is complete. Heart & Halo only uses oils that are good for you, not the common oils that may leave carcinogenic residue in your body. They are always wholesome foods that remind you of home. Why did you decide to open a restaurant here in Byron Bay? I realised that local people want down to earth, quality food. There are a lot of health shops offering organic produce but they tend to be very expensive. I opened Heart & Halo to offer the local people exactly that but at affordable prices. Could you name some of the produce that you use here at Heart & Halo? We use organic Himalayan salt and cold press oils to improve my customers well-being. Why do you think it’s so important to use organic produce? It’s basic human nature to look after each other, and by growing foods organically, it’s simply looking after something that looks after us. It’s really nurturing through food. Festivals and celebrations are based around feasts and sharing, food is so important to so many cultures so it’s only right that we respect it. Yes, by the time I was 17 or 18 I was over meat. I had worked in cafes and restaurants in Sydney and was sick of the smell, oil, and fat. There’s a huge disconnection between people and meat these days. They only see it in cellophane. What inspired you to open Heart & Halo? The idea came together after I had travelled. I’m a believer in indigenous cooking and the way it’s made with love. They are always wholesome foods that remind you of home. Backpackers come here and say that ‘it tastes like home’, which is great. I loved how diverse the diets were in India. How they live is just amazing! Too many people live on land that’s half the size of Australia, and they manage it in harmony. I believe it’s because they are all working for the same reason, whether it be a group or family unit. I was looking for something real to do, so naturally I thought of feeding people. So you teamed your beliefs and travel discoveries together to create Heart & Halo? It’s not about me, it’s about the food. There’s no ego here, not like MasterChef! I didn’t create it, I’m just passing the message on through the love and appreciation of food. I’m so thankful of the opportunity I have been given to spread the love through the food I serve. Special thanks to Tusta & Christie for making this happen.